The warmth your furnace provides makes it one of the key systems in your home. For your furnace to be dependable and provide the comfort your family needs, it needs to be running at optimum efficiency. The professional technicians at Treat’s Heating and Cooling will keep your system running smoothly, or share the many options available for a new furnace installation. There are many factors to consider when your family is considering installing a new furnace. The amount of total area that your space requires to be heated, is the first place to start. Many homeowners assume the measurement from their old furnace will be sufficient for a new system, but it’s important to have an accurate measurement to ensure the heat load calculation is up to date. Without an accurate measurement, you could choose a system that does not meet your home’s actual heating needs. Another factor to consider is whether or not your furnace is achieving maximum productivity without wasting effort or expense. An efficient furnace will allow you to have lower monthly energy bills. The most recent models produced for gas furnaces currently carry ratings up to 98% efficiency. There are also electric furnaces that are considerably more efficient that those of old. The important aspect to remember is to compare prices of both energy sources. Choosing the furnace that is right for you is an important decision, and the friendly, knowledgeable technicians at Treat’s Heating and Cooling are ready to help you in the process. One of the most underestimated needs of a furnace is maintenance. Most homeowners disregard maintenance since their current furnace is working well. 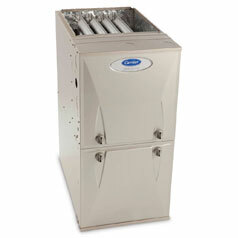 To keep your furnace operating at maximum efficiency for the life of the system, annual maintenance is the key. Treat’s has been servicing furnaces in Washington for over 40 years. Our skilled technicians will inspect your furnace for any parts that may need to be serviced, as well as clean all components, and ensure your furnace is not leaking carbon monoxide into your home. No matter how well you keep up with regular maintenance, furnaces eventually begin to show signs of wear and need repair. Unusual noises coming from your furnace are an indicator that you should call Treat’s Heating & Cooling for repairs. In addition, should your furnace begin to not heat the house well or there is a dramatic increase on your energy bill, contact Treat’s and we will send our finest technicians out to resolve the matter quickly. It is much better for you in the long run to fix a minor repair now before it becomes a major repair tomorrow. 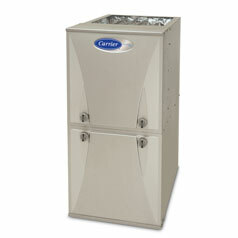 Occasionally, repairs alone will not fix your furnace and you will need to purchase a new system entirely. Repeated calls for repairs or ongoing underperformance of your system resulting in minimal heat for your family are both indicators that it may be time for a new furnace. Sometimes the system is still working, but the efficiency is so poor that it may make more sense for your budget to replace your system entirely. Regardless of the reason you may need to replace your furnace, you can expect the experts at Treat’s Heating & Cooling to help guide you to a furnace that is the right fit for your home and honors your budget. For the optimal combination of gas heating and impressive energy efficiency, choose Carrier precision-engineered gas furnaces, from the innovative Infinity® ICS with precision temperature control to the solid Comfort™ 80. The higher the AFUE rating, the more energy efficient—meaning you’ll save more money. The Infinity® 98 gas furnace family offers Greenspeed™ Intelligence innovations that save on utilities and includes a model size that is the quietest furnace you can buy2 and a model size that is the most efficient gas furnace you can buy3. 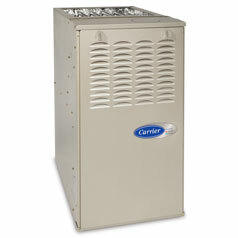 Even though Carrier is our preferred Brand of choice, we service & maintain all major brands of Gas Furnaces. Please call for any questions regarding any Brand of your choice. We would be happy to serve you!